Sometimes as a dairy farmer I am very distraught by the things people say about the dairy industry. We treat animals with respect and give them the best care possible. We depend on them for our livelihood, just as our animals depend on us. It’s a mutually beneficial relationship. That’s why it’s hard to listen to people bash us and our industry by saying negative things; condemning us for inhumane treatment of animals while the complete opposite is true. Recently Mercy for Animals, an animal rights activist group, released some “undercover” video footage of a ranch not treating baby calves right. As a dairyman, I was completely appalled by the footage. I found it extremely disturbing, and it really motivated me to write about this. I think that the “undercover” video footage that Mercy for Animals puts together is meant to disturb you. They stage these events in order to provoke you, to motivate you to take action. I will admit it is very motivating, because I was extremely disgusted with the video, and cannot bear to let this happen to other animals. They stage these incidents of animal cruelty themselves in order to promote and push their agenda. Their agenda being that everyone should stop eating products produced by animals. They hate people involved in animal agriculture, and want to erase the industry from society altogether. Since they are a minority opinion though, they need to convince you that people on farms hate their animals and abuse them on a daily basis in order to convince you to take action and join their cause. I think anyone who knows a local farmer, though, will know that animals are treated very humanely on the farm. I for one can confidently say though that no dairy farmers treat animals the way that Mercy for Animals would have you to believe. There is no motive, or reason for a dairy farmer to treat the animals on their farm inhumanely unless they are truly depraved people. Dairymen are motivated to treat the baby calves on the dairy humanely because they are the next generation for the farm. 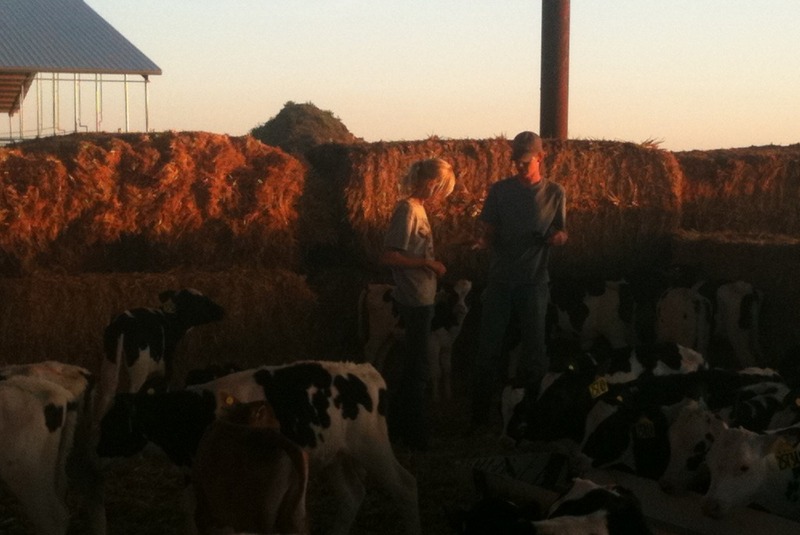 Just like you want the best for your children, we want the best for our calves. We treat them well because happy cows really do produce the best milk. Let me tell you how we treat the baby calves. 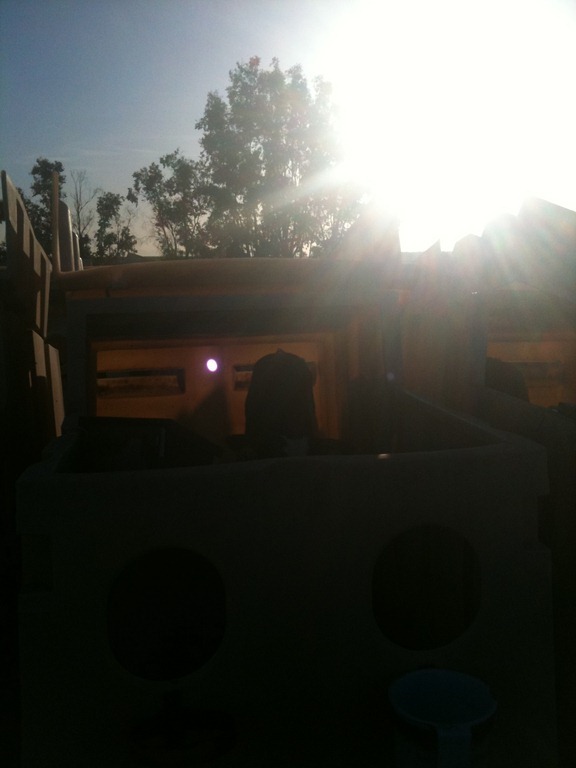 When the baby calves are born we put them in hutches so they can have a clean, safe, stress free environment. The reason we separate them from the mother is that the mothers can be very careless at times. The hutches are a safe place where they won’t get stepped on or pushed around by the older cows. If you want to think about it this way, the calf pens are basically big play pens, like a play pen you would keep your toddler in to keep them out of trouble. The calves stay in the hutches for about 2 months, and then move into a much larger group pen where they can play with all their friends. During those first few weeks though it’s critical that they remain separated because their immune systems are still developing. Any illness at this point of their life will severely affect their growth so we try to keep them as healthy as possible. We use some basic antibiotics if they get sick, which helps them overcome any illness they might get. 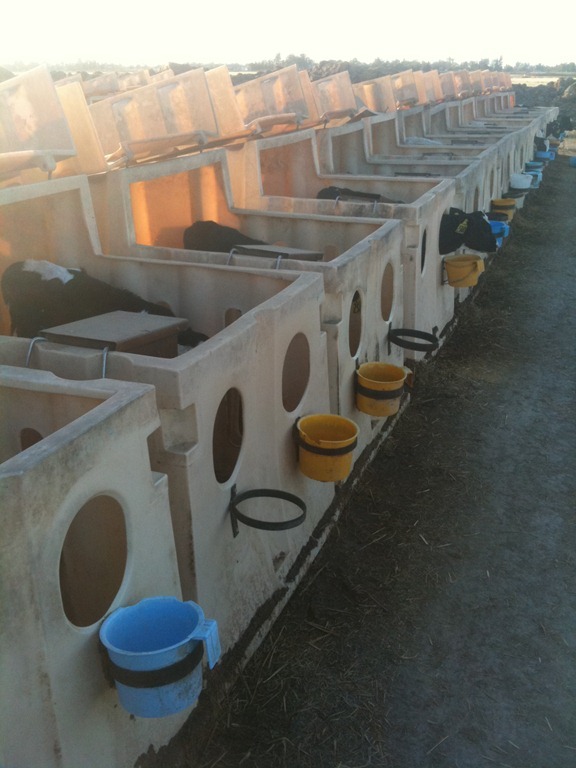 Calves are fed two times every day, morning and afternoon. 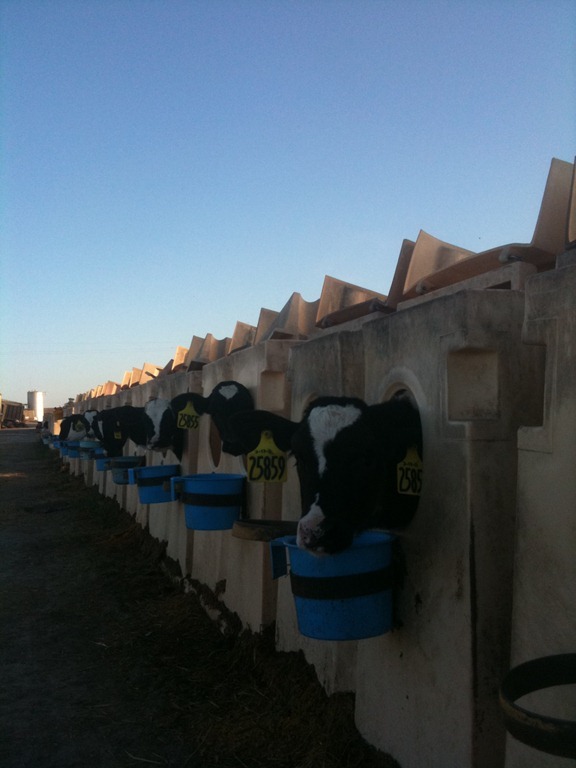 They get a nice bucket full of milk so they can grow healthy and strong. In addition we have grain bins available in their pens so they have free access to grain whenever they want. 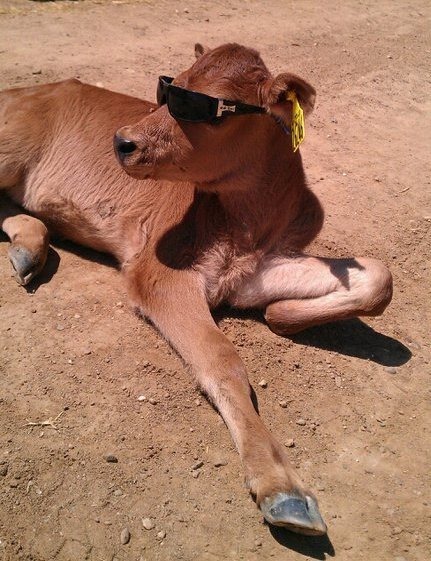 Grain is high in protein so the baby calves can grow more quickly. In the summer time when it’s very hot, we also make sure to keep water available to them in addition to the milk they get. Sometimes on the extremely hot days, we give them electrolytes (Gatorade for calves) to keep them properly hydrated. So nutritionally they have a very healthy and sound diet and are always kept fed and well nourished. It’s important to keep them healthy with a stress free environment and that’s really our primary goal in raising the babies. They are our farms next generation so we make sure to treat them well on our farm! I know for a fact that all other dairy farmers have this same motivation to treat their cows and calves humanely and keep them comfortable. Mercy for Animals and other animal rights activists definitely have an agenda, which they will enact using any means possible. 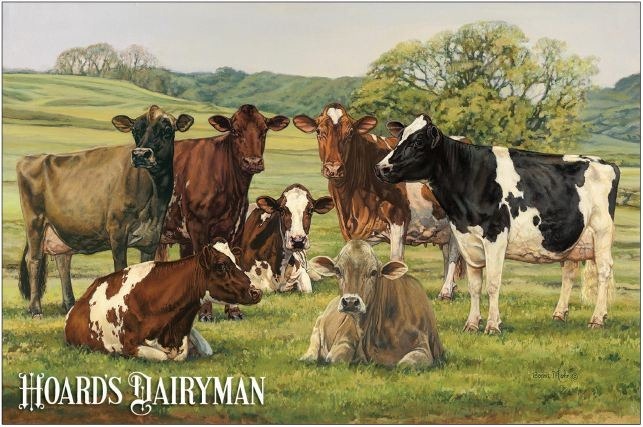 All I can say is that dairymen have no motivation to treat animals badly. In fact only the opposite is true, we have full motivation to treat animals well. The better care we give to the animals the better they will be at taking care of us, and that’s just the plain simple truth. Its harvest time here on the dairy. 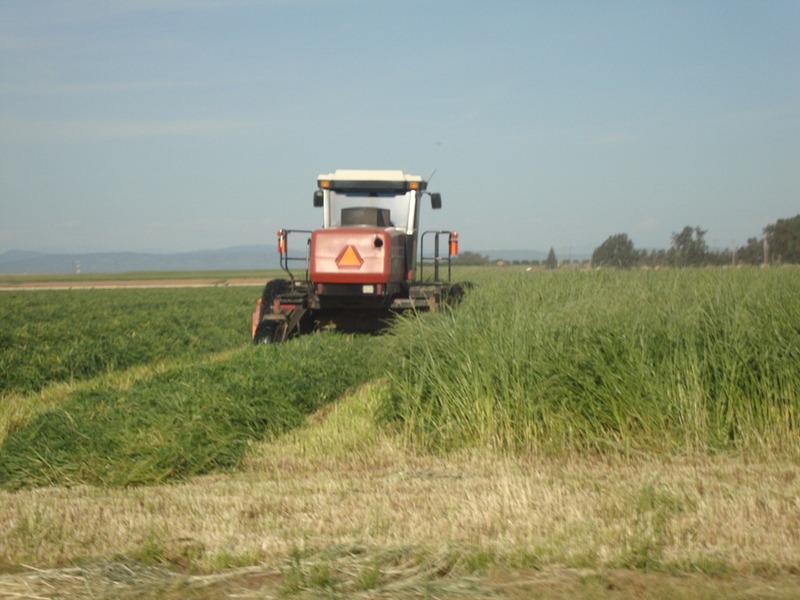 We’ve been busy cutting the oats and rye grass that we grow during the winter months here in California. I guess that’s one of the great advantages of being in California. 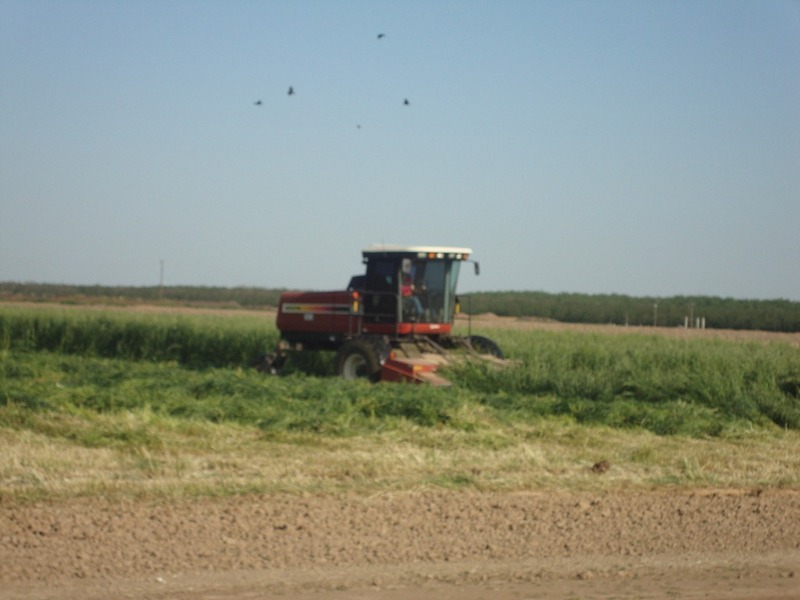 The growing season is long enough so we can grow 2 or even 3 crops per year instead of just one. Back east many farmers can only grow one crop before the winter snow covers the ground. Here in California, the sunshine state, we can really make the most of the land that we have. 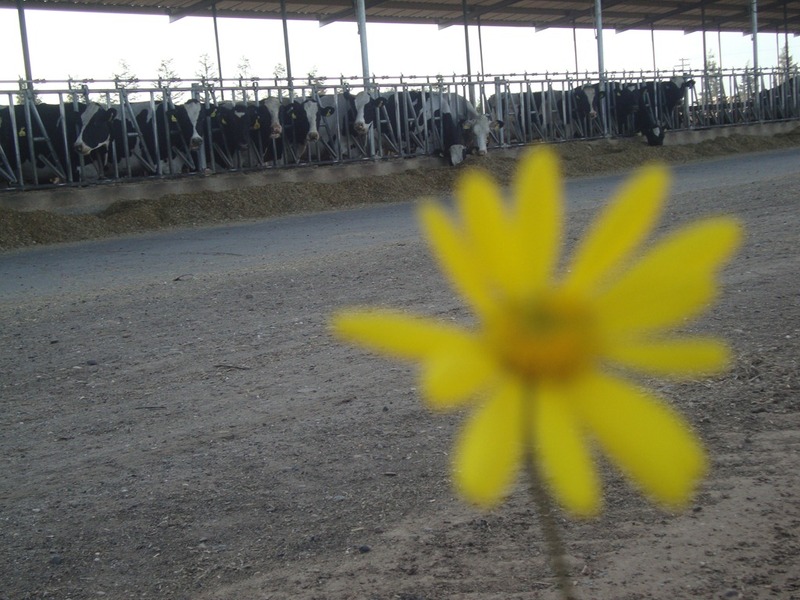 I think that’s one of the many goals dairymen have: to maximize the resources we have. 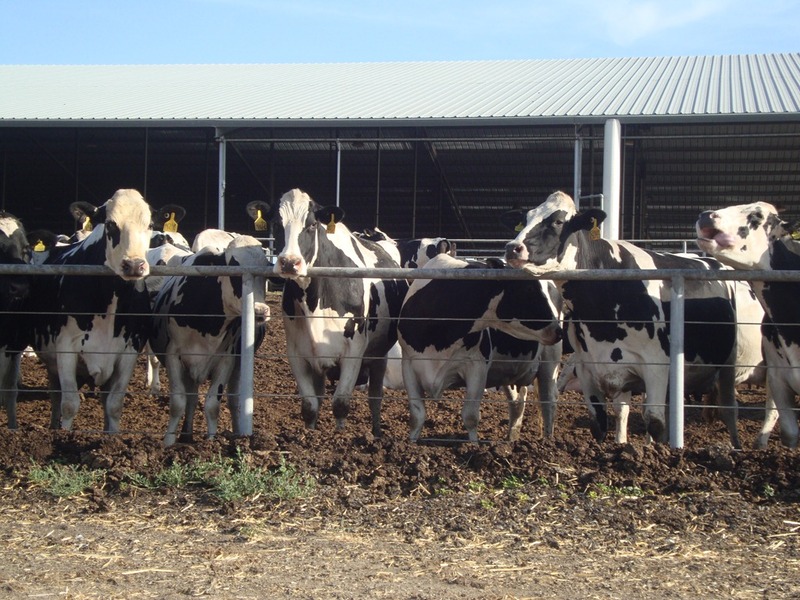 Many people wonder why all cows are not on pasture, and housed in barns. It’s probably for the simple reason that grazing cows requires a lot of land for pasture. 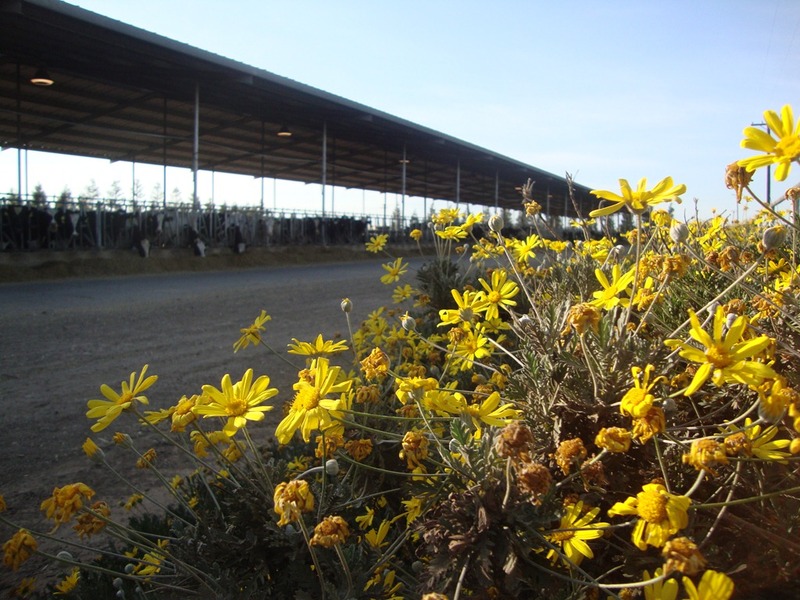 If all our cows needed to be grazed, it would take thousands of acres of pasture land to grow enough food for the cows. Cows eat a lot! 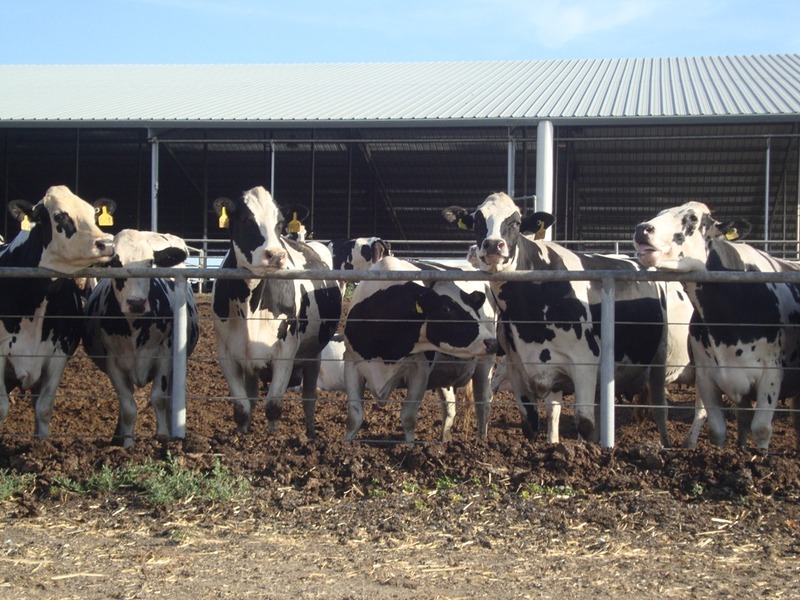 The modern way of dairying is probably more environmentally friendly too because we are producing more food with less land. 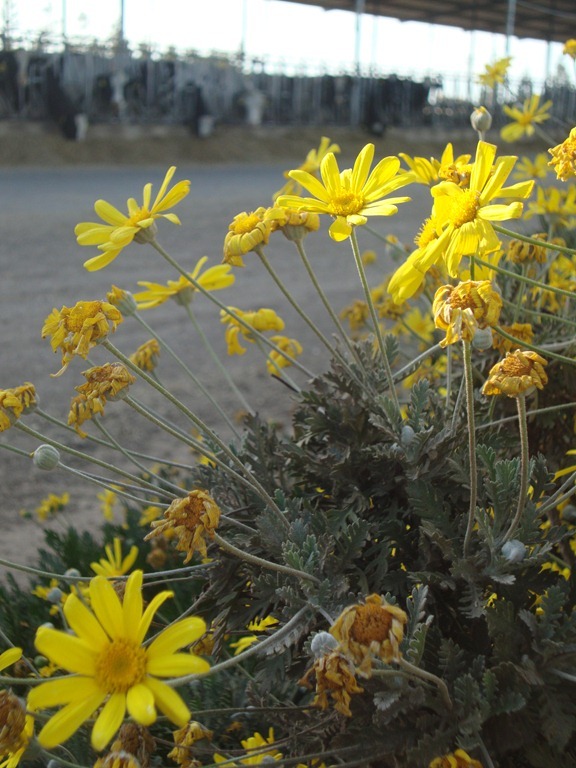 Instead of growing pasture grass, we grow feeds that grow thicker and grow much taller. 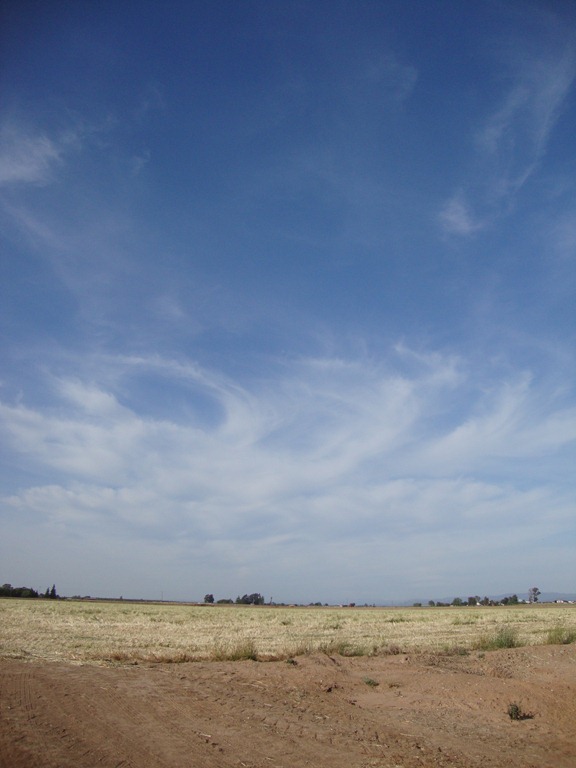 For example, in the summer we will be growing corn which grows upwards of 6 feet, here in California. The entire cornstalk can be eaten by the cows so you can produce a lot of food with very little land. I think everyone would graze cows on pasture if they could, but there just isn’t enough land to do it. By maximizing our land to grow as much food as possible, we are conserving land so it can be used to grow other crops for other food we need. From the picture above, you can get a better idea of how much food can be grown. 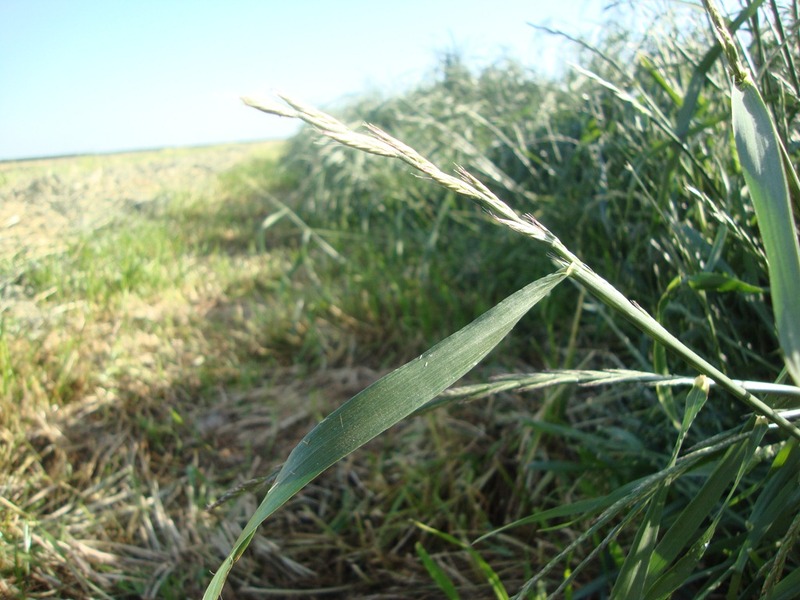 The oats provide much more food than a pasture can provide. 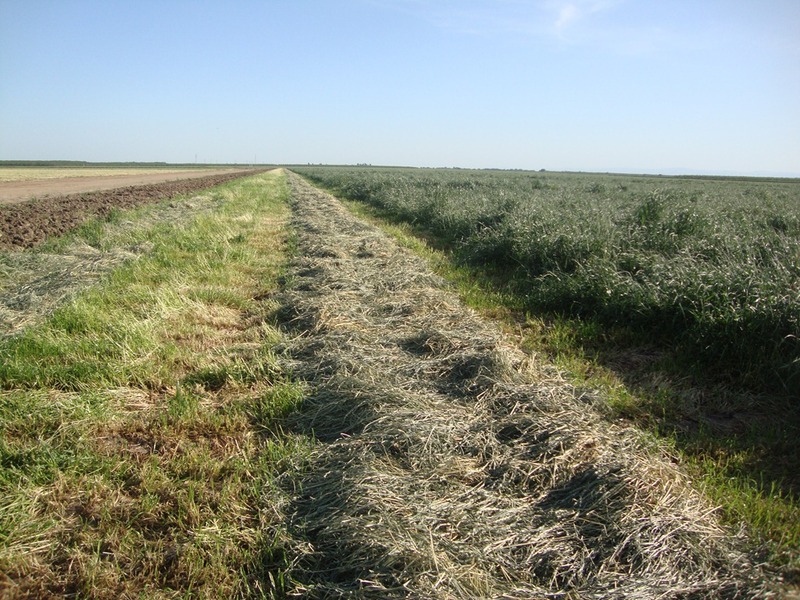 Once the oats are grown, they are cut and piled into very neat rows. Also surprisingly there is still a great deal of wildlife around the dairy noting the picture below. 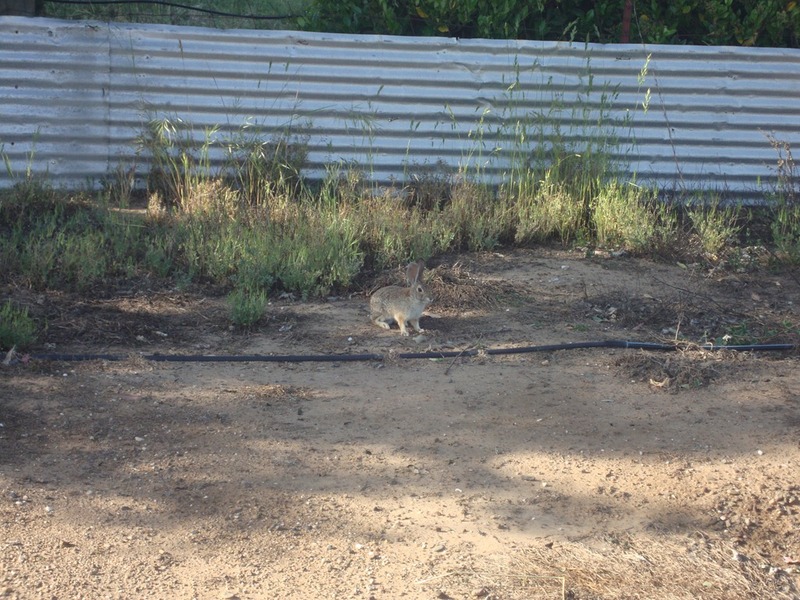 Jack the Jack Rabbit seemed to be following us. 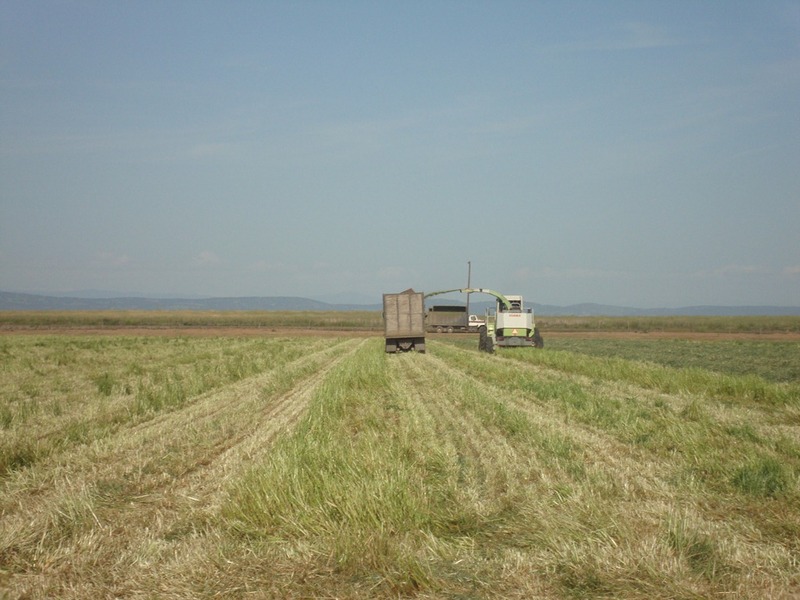 When the oats are ready to be cut, we use the machine shown in the picture above to cut them. 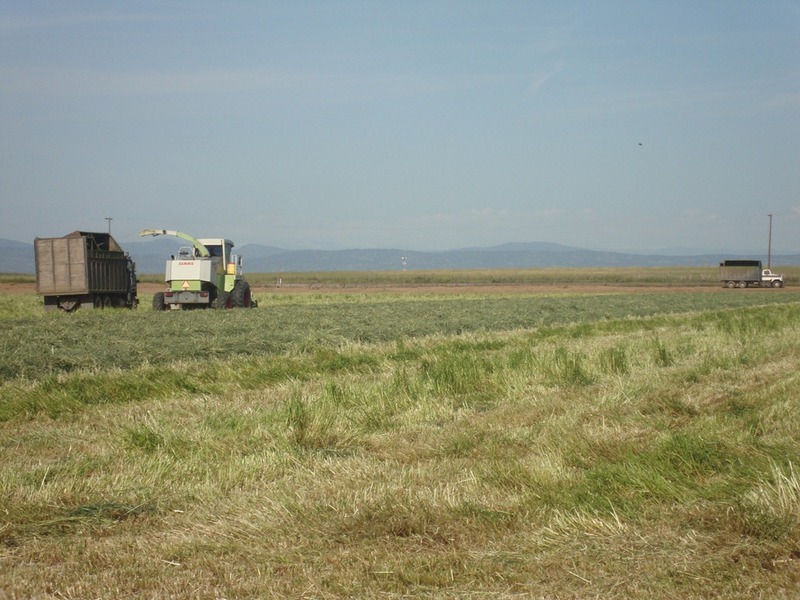 After its been cut and piled into rows, another machine process the oats further cutting it into smaller pieces, and then shoots it into the trucks. Cutting the feed into small pieces really helps make the feed more digestible for the cows. Basically this means that more food is actually digested and used by the cow to make milk, instead of simply passing through the cow’s digestive system unused. 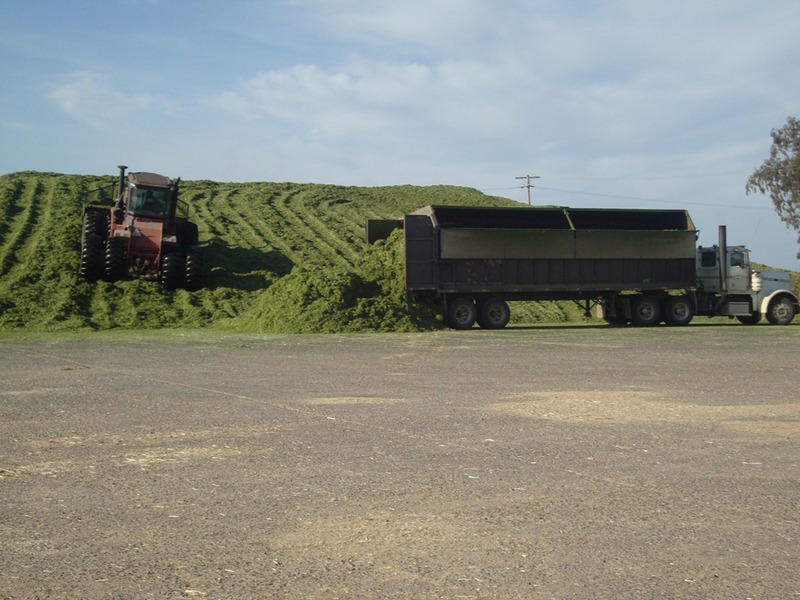 The feed is then piled into a large pile and packed tightly by a tractor that pushes the cut feed into the pile. 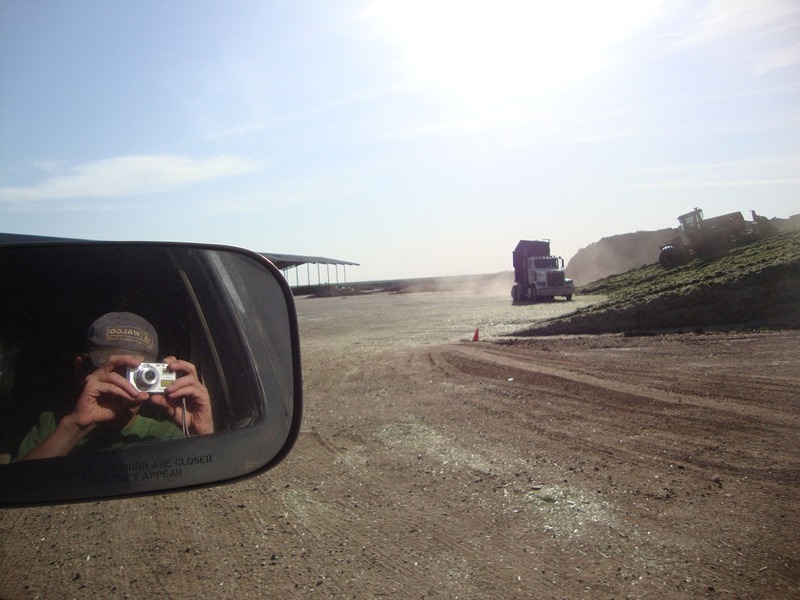 The packing tractor is essential because it eliminates oxygen from the pile. If the oxygen remains in the pile, spoilage will occur. So the oxygen is eliminated, and bacteria are added to start the fermentation process which then preserves the food for years. 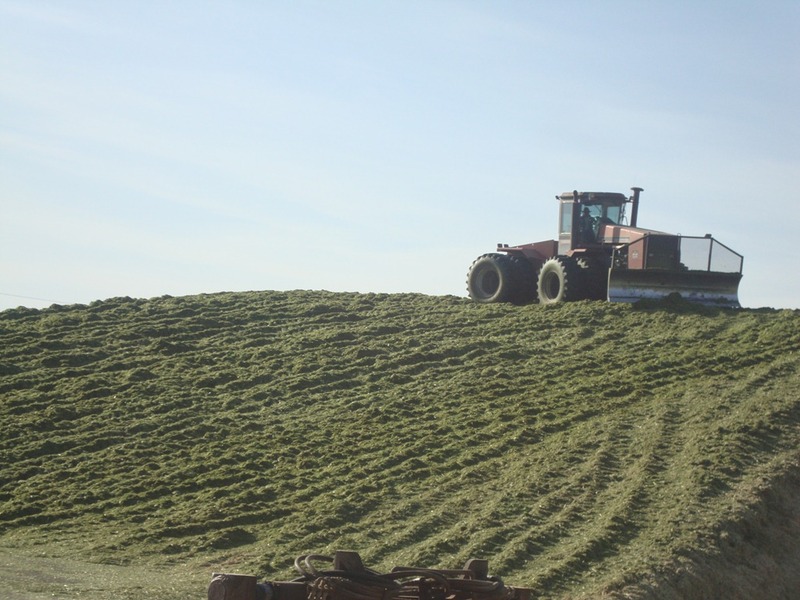 The silage pile shown below will be all gone by next year though. As I mentioned before, cows eat a lot! After we finish cutting the oats, we will be planting the corn so stay tuned.